The new 3 phase version Model 2023A is offered in two different versions also. A 3-phase wattmeter 2023A, or the Model 2023A-XP version power analyzer. 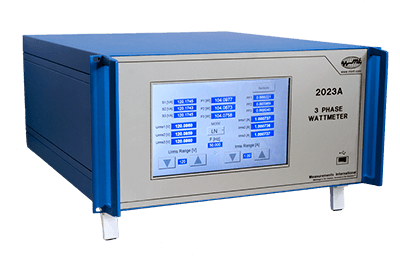 The 2023A-XP is a 3 phase power analyzer that has the additional features of total harmonic distortion analysis, complete waveform analysis and phasor analytical representation. A large touch screen display is used to change the input parameters and for indicating the voltage, current and power measurements simultaneously. Waveforms of the input voltage and current can also be displayed and saved to a USB Stick on the front panel or transferred to a computer over the LAN. An Rs232 interface is standard and an Optional IEEE-GPIB card is available. With the IEEE Card only the Voltage, Current and Power values can be transferred. Waveform data is transferred over the LAN. The 2023A can be used to measure line to ground and line to line voltage measurements that are 120° apart with one current input. The current input is a two-stage-compensated current-transformer with 10 current ranges from 5A down to 5 mA, the voltage input consists of an accurate voltage divider with 120V and 240V ranges. The displayed output for power is expressed as VI Cosɸ. The measurement high accuracy’s is maintained for all power factors. The relative conversion error of the output is linear and does not depend on the magnitude or distortion of the input signals.